John Tavares has been one of the premier goal scorers in the National Hockey League for a number seasons. Tavares’ goal scoring prowess can be attributed in part to his skill level, but also to his intelligence and understanding of the tactics and strategies goaltenders employ to defend to the net and how to exploit them. The term “Quiet Eye” was first proposed by University of Calgary scientist Joan Vickers and refers to the location of the goaltender’s eyes or “gaze” immediately prior to the release of a shot. In a 2006 study of Quiet Eye and goaltender performance, Vickers found that the most successful goaltenders were able to fixate their gaze on the puck and the shooter’s stick blade prior to the release of a shot for much longer periods of time than those who struggled to stop the puck consistently. When a goaltender is attempting to determine where the puck is travelling as it exits the stick blade the goaltender completes a sub conscious process where they analyze the angle of the shooter’s stick blade to determine the trajectory of the shot (low, middle or high) and the location of the shot in relation to the mid line of the goaltender’s body (blocker side, glove side or middle). Once this process is completed the goaltender initiates their save response, choosing the save selection they believe gives them the best opportunity to make the save. What does this mean for goal scorers? It means that the longer the puck remains in contact with the shooter’s stick blade prior to the shot release, and longer the puck remains in a consistent, stable position on the shooter’s stick blade, the easier it is for the goalie to narrow their gaze on the puck and shooter’s blade and subsequently determine where the puck is travelling. John Tavares is a master at manipulating the puck by dribbling it quickly in different directions prior to releasing his shot. During his training session at Cutting Edge with SL49 Head Instructor Stefan Legein, Tavares feverishly shifted the puck forcing the goaltender to continuously shift both their eyes to maintain their gaze on the puck and their feet to move laterally to maintain their angle. By quickly maneouvering the puck from forehand to backhand and vice versa prior to shooting, Tavares prevents the goaltender from quieting and narrowing their gaze on the puck. The goaltenders eyes are in constant motion prior to the release of his shot making it next to impossible for the goalie to fixate their gaze for a long enough period to read the release correctly. Similarly, Tavares is able to create shooting lanes when none appear visible simply by changing the angle of attack, shifting the puck left or right and opening up net that wasn’t initially available to him. If you want to make it easier for the goaltender to make a save, simply approach the net with the puck in the same position on your stick blade for an extended period of time and the goalie will have no problem reading the release of the puck off of your blade and making the save. Deception is critical to scoring goals and John Tavares is truly a master of deception. Check out his wizardry in action in the video below. 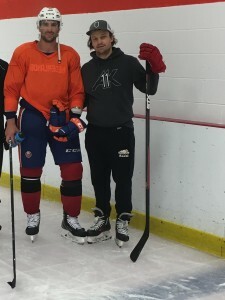 On Wednesday, August 16, NY Islanders and Team Canada star John Tavares participated in an intense and high tempo training session with the Head Instructor of Cutting Edge’s SL49 Pro Skills training program, Stefan Legein. The session lasted approximately 55 minutes and featured a variety of game like drills designed to enhance Tavares’ ability to score off the rush, on down low options below the face-off dots and off of one timers on the power play. Watching the Oakville native train, it is easy to see why he is widely regarded as one of the top 3-5 players in the world today and why he will be a highly sought after free agent next summer should the Islanders fail to resign him before July 1, 2018. Tavares’ skating, puck handling, shooting and goal scoring skills were quite apparent. As were his intelligence and creativity in a variety of game situations. However, there were 3 unique attributes that Tavares displayed that allow him to stand out from almost every hockey player on the planet. This blog post will highlight the first of the three attributes, Tavares’ understanding of the concept of deliberate practice. Tavares’ approach to practice is deliberate and planned. There is nothing haphazard about it. If you have ever had the opportunity to watch an expert in any endeavor perform, one aspect of their performance that will immediately jump out is their approach to practice, which is entirely different from amateurs or even other pros who are good, but not elite performers. The work ethic and attention to detail Tavares demonstrated was eye opening. He wasn’t there to get in shape or get ready for the coming season. He was on the ice that day for one simple reason – to become a better hockey player. In fact, listening to him speak after the on ice session, it is obvious that almost every decision he makes in life revolves around what will make him a better hockey player. At no time did he go through the motions. Every single repetition was completed at top speed and with a focus on executing every skill and tactic perfectly. Tavares is a true practitioner of deliberate practice. He doesn’t simply practice the skills he is already good at and can execute comfortably. Instead, he identifies the areas he needs to improve on the most and then attacks his weaknesses until they become strengths. Tavares operates at the extreme edges of his talent and skill level, continuously pushing himself to execute new skills and movement patterns at the highest pace. He repeatedly stretches himself beyond his current abilities, always hungry to achieve more and never full and satisfied with where he is at with his game. While he was resting between repetitions, Tavares could be seen on one knee visualizing the next repetition. As soon as he had recovered sufficiently, he would begin the next repetition attacking the drill at top speed and executing his game plan flawlessly utilizing new moves, fakes and tactics than previous repetitions. After each repetition Tavares would immediately seek out feedback from Legein on how he had done, what he could do differently, if anything, and what he could try in the next repetition. If Tavares were a golfer he wouldn’t simply show up to a driving range, drop a bucket of balls and continuously spray the ball all over the range, without a preshot plan and routine, any idea of why he can’t hit the ball straight, or immediate corrective feedback from a skilled and knowledgeable coach. Instead, he would train with a purpose and plan for every shot, and in conjunction with his coach, analyze the results of each shot, good or bad while making adjustments as required. If you’re a young hockey player with a desire to play hockey beyond the minor hockey system – major junior, NCAA or even professional hockey, the attitude and work ethic you display during practice will go along way to determining how far you go. Always practice with a purpose and get a little better each day.